This sculpture is located in the sculpture garden. 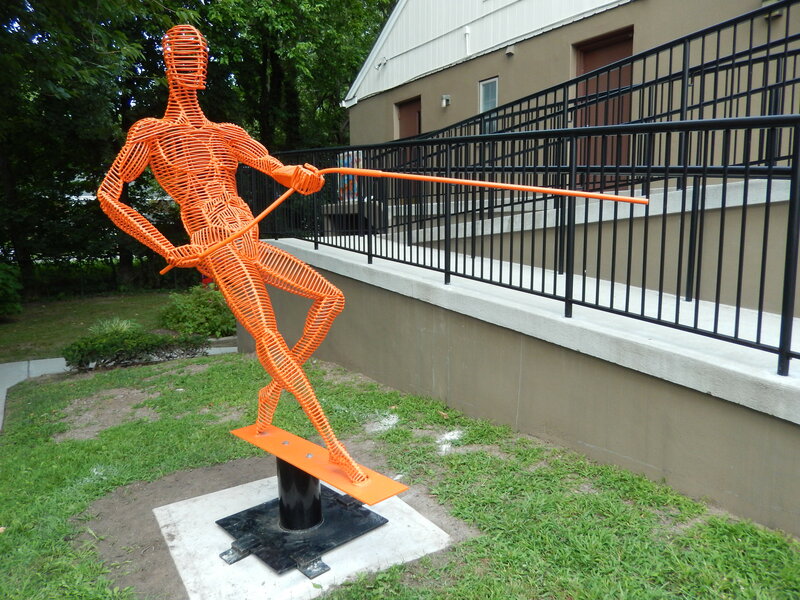 Motivated by his study of human anatomy and movement, Jack Howard-Potter works with steel to create large-scale figurative sculptures. His work has been on display throughout the world in outdoor sculpture parks, galleries and public art exhibitions. Howard-Potter grew up in New York City where he was inspired by the public sculpture of Alexander Calder, George Ricky and various performance, dance, and artistic exposure. He earned a BA in Art History and Sculpture from Union College and has been making and displaying his original sculpture since 1997. After college, Howard-Potter moved to Colorado and worked with a blacksmith creating furniture and learning about the properties of steel, the medium that he would eventually use to create his art. Howard-Potter also gained the skills to convey a heightened sense of fluidity in solid steel while learning about the commercial practices of metalworking. In 2001 Jack enrolled in anatomy and drawing classes at the Art Students League in New York City to further his skills as a figurative artist and understand how the human form works and moves. Famed artist and instructor at the League for 40 years, Anthony Palumbo, selected Howard-Potter to work as his assistant and eventually became his mentor. For two years Jack immersed himself in the human form, sketching five days each week and completing thousands of drawings. It was this practice that gave him the in-depth knowledge of human anatomy that can be seen in his work today.